Where is Blind Tom buried? Blind Tom died at age fifty-nine on June 13, 1908 in Hoboken, New Jersey. A few days later The New York Times headline read "BLIND TOM, PIANIST, DIES OF A STROKE -- A CHILD ALL HIS LIFE." Newspaper coverage reported that Tom was buried in Evergreens Cemetery in Brooklyn, New York. 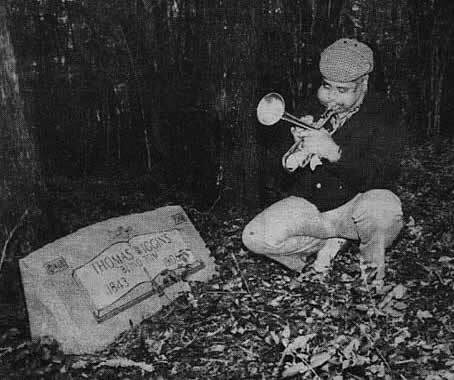 However, over the ensuing decades, controversy has surrounded Blind Tom's final resting place. Some historians related that in a final victory for custody of Tom--twenty years after his death--Fannie Bethune, the youngest surviving daughter of James Bethune received permission to move Tom's body back to his old home in Georgia. They give his final resting place as the old Westmoreland Plantation just outside of Columbus, Georgia where a historical marker was erected in 1954. The claim by Columbus, Georgia historians may be based in part on an affidavit by Jack Moore dated 1949 detailing plans by Fannie Bethune to move a body she believed to be that of Blind Tom from a cemetery at Westmoreland to the Bethune family plot in Columbus, Georgia. The contract was never consummated due to the death of Fannie Bethune. The one missing link in the Fannie Bethune claim is documentation that Tom's body was first removed from his initial resting place in Brooklyn, New York to the state of Georgia. 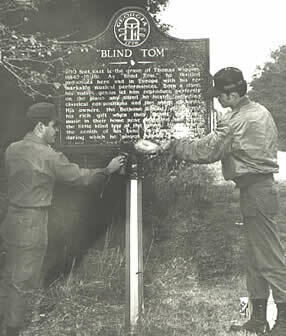 In spite of additional concrete evidence that Tom's body had indeed been removed to the state of Georgia, the Georgia Historical Commission erected a historical marker to Tom in 1954 indicating the site of Tom's grave. The marker is located on Warm Springs Road outside of Columbus, Georgia. dedication for a new headstone for a grave believed to be that of Blind Tom. Photo courtesy of Bill Walton. (1843-1908) As "Blind Tom" he thrilled audiences here and in Europe with his remarkable musical performances. Born a slave, his native genious let him reproduce perfectly on the piano any sound he heard, including musical compositions and the songs of birds. His owners, the Bethune family, discovered his rich gift when they heard exquisite music in their home near Columbus and found the little black boy at the piano. He reached the zenith of his fame on European tours during which he played before royalty. 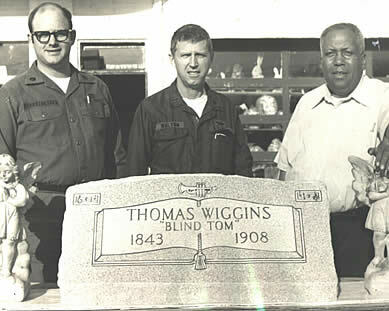 In late 1975, the 34th Medical Battalion, at Fort Benning GA took on the task of putting a proper marker on the grave of Blind Tom Wiggins, as a Bicentennial Project. I was the Battalion project officer for this effort. We collected donations from everyone who wanted to give, but were still short several dollars on buying a proper tombstone. Sgt Bruce Bergstresser and I went to see Ed Stovall, who had a monument business in Columbus. I explained the project and told him we were a tad short on funds. He replied, "Give me what you have and go out in the yard and pick out any tombstone that you like. I will engrave it and place it on Blind Tom's grave. I am happy to be able to help in a project like this." The picture was made when we went to look at the stone, for the first time. I had requested that Stovall put some musical notes on the marker, but the trumpet was his idea. When I told him the Tom was a piano player it didn't take him a second or to to say, "This trumpet is the one Gabriel used to call Tom home." Lisa Battle, Ledger-Enquirer reporter who was covering this story put that quote in one of her articles. 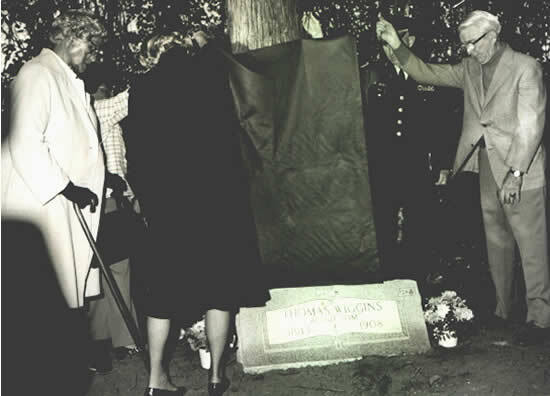 The marker dedication at the Westmoreland estate took place on 10 Feb 1976. My battalion commander wanted to put a little marker on the tombstone indicating that it was placed there by the 34th Medical Bn. I convinced him that this was "tacky-first class" and besides if you add up the figures in the dates it totals 34, the number of our Battalion. Coincident-Of course, but it worked. I know there is some question about Tom's birthdate so we used the same dates which are on the bronze historical marker, put up by the GA Historical Society on nearby Warm Springs Road. 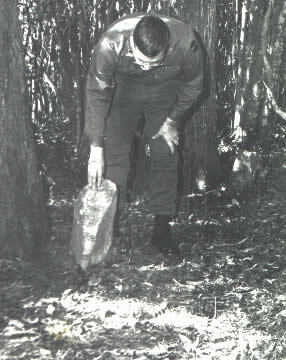 Lt Wayne Valadez, 34th Medical Battalion, looks over the gravesite and original tombstone once believed to be that of Blind Tom, on Westmoreland estate, near Columbus GA. Bruce Bergstresser and I assumed the responsibility of digging up this tombstone so the new one could be put it place. We did not realize how big the stone was or the fact that the cedar tree on the left had wrapped it's roots around the stone. It took us a long time, digging and chopping, to remove the original stone. After we were finished I asked Mrs. Fredrick Dismuke if she wanted to keep the stone. She said, "No, it is just an old rock as far as I am concerned." So Bruce and I carried/rolled it to my car and drove it to my house. It has been in my backyard for over 25 years. I keep trying to interest some of the local historians into putting the stone "somewhere," but so far no luck. 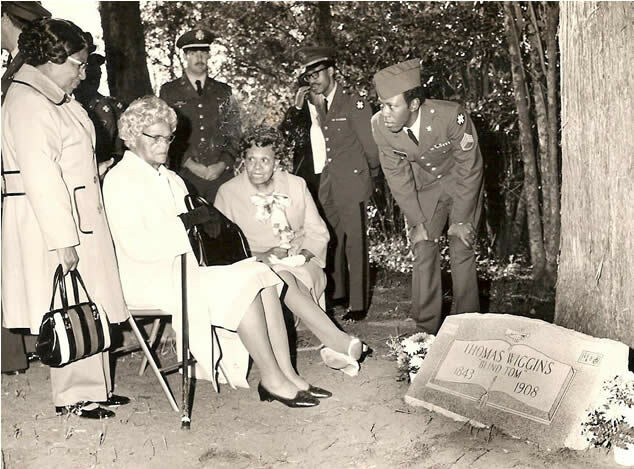 The participants at the dedication of the Blind Tom marker at Westmoreland estate, on 10 Feb 1976, were Elnora Walker (left), Tom's niece and the only person I could find that had seen/been with him, Fredrick Dismuke (right), who owned Westmoreland, and LTC Donald L Hull (second from right), 34th Medical Battalion Commander. They were supposed to raise the cloth covering the tombstone. But at the last second, Therese Dismuke came out of the crowd and lifted the cloth herself and then stepped back into the crowd. It happened so fast that I don't think Mrs. Walker ever realized what had happened. I was laying under a cedar tree and snapped this picture just as it took place. I made another after Mrs Dismuke disappeared and that was used in the local paper. But I think this one tells a better story. Following the dedication ceremony Mrs Dismuke invited the all the attendees for a tour of Westmoreland and refreshments. Nothing was ever said or written about her participation in the ceremony. Also present at the dedication was family member Carrie E. Wiggins Poulain-Ford shown standing on the left in this photo next to Elnora Walker who is seated with the cane. - photo courtest of Henry Stallings, Jr., January 2006. Dizzy Gillespie Plays "When The Saints Go Marchin' In"
near Columbus, Georgia, May 1979. Photo courtesy of Columbus Times. Musician John Davis who has spent a number of years researching the life of Blind Tom released a CD of Tom's music in January 2000. Davis claims that an examination of cemetery records at Evergreens Cemetery in Brooklyn, New York indicates Tom's body was never moved from its original unmarked grave. Davis provided viewers with a look at the original gravesite in Evergreens Cemetery during a PBS broadcast of LIFE 360 that aired October 19, 2001.On July 1, 2002, a tombstone was erected in Evergreens Cemetery in East New York to mark Tom's final resting place. The ceremony was reported by The New Yorker magazine in their July 15, 2002 issue. 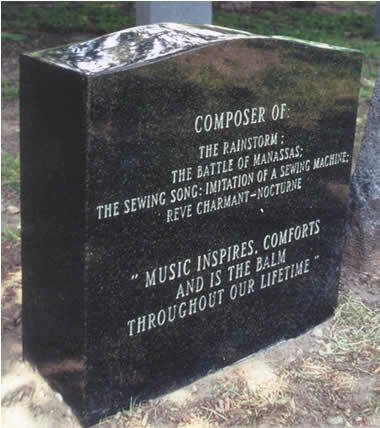 Photos of Tom's grave marker in Evergreens Cemetery in New York are courtesy of John Davis. Return to Blind Tom's biography "Archangels Unaware." Listen to Tom's composition: "Battle of Manassas"
Listen to Tom's composition: "March Timpani"
Special thanks to "PeanutJake" for making these midi files available. 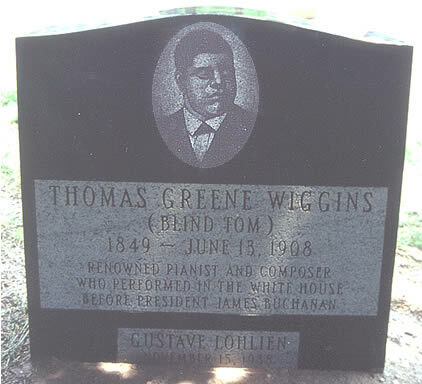 Read the original biography of Blind Tom that was printed on his concert brochures. Read the full account of Mark Twain's report on Blind Tom. Making of America web site at Cornell University. Read the memoir of Tom's teacher Anna Amalie Tutein from Etude Magazine, February 1918. The New York Times obituaries for Blind Tom. Read Henry Watterson's memories of Blind Tom from the week Tom died. Read the testimonial of Miss Georgia Routt who challenged Tom on the stage. Historic American Music web site at Duke University. More photos of Blind Tom.